As some of you may know, there is soccer cup being played in the US this month. The oldest soccer tournament takes place in US. Where national Teams from north and south america will play for the first time to define the best team in Copa America. 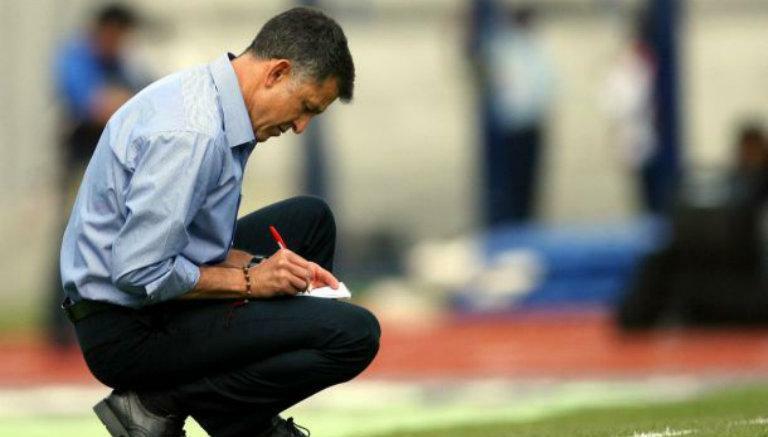 Juan Carlos Osorio, writing his findings during a soccer match. This year the tournament, includes countries from all over America. Typically includes teams from south america with special guests. This year is different, since the cup reaches 100 years. Mexico is playing and had a strong first game, beating 3 to 1 to the powerful team of Uruguay. Mexico´s Coach, Juan Carlos Osorio has been on the spot. Not only for being a foreign coach training Mexico´s team, but for the strange and unusual ways to train a team. Watching Mexico´s game couple of days ago, the TV analyst told a story about Juan Carlos Osorio that made me remember how lean methods may seem mysterious, weird or wrong for people who isn´t related to it. The analyst mentioned that Osorio often, in the middle of the game, would call a member of the team (a player) and would ask him to give his opinion on the game. Which is of course, something very unusual for a coach to do in soccer and I bet is not common in other sports either. Usually coaches are the ones who give opinions, take decisions, speak up, and players need to obey and follow the strategy the coach impose. That made me think about how Lean organizations, involve workers in improvements, in operations design, and also in the solutions to solve problems. Successful lean organizations, allow the workers to speak up, point out problems, and work to solve them. They are encouraged to give their opinions and to work on issues or problems. They find purpose on their jobs. How many organizations do not allow people to speak and discourage any creativity inherent in workers? It`s true the common rule in sports and companies is that the leader speaks, everybody else listens, and obey. When a leader admits that needs some input, that doesn´t know all answers or decides that it is necessary to hear workers opinions, people around him/her wouldn´t seem to understand why. It is expected that leaders know what to do. They should direct, provide answers and guide. How ever, as many lean organizations have taught, listening and showing respect for people often provides greater results in the long run. It is through people engagement that true continuous improvement can be achieved. Clic here to be re/directed to Toyota's website where they explain further the concept and how along with Continuous Improvements shape the Toyota Way. Remember during my early days in manufacturing. I was a young superintendent and was often in the floor learning and sometimes doing things myself. I learn better by doing and to really know what the workers were talking about, used to do things myself (whenever was possible). And I remember that one time I heard some managers talking about me, saying that my problem was that I didn´t act as a manager, but as a worker. I imagine they meant that my future was doomed if I continued doing things in the floor. Its true, small details such as doing things and getting dirty, or perhaps, ask for a worker´s opinion might seem odd. Even when they are the right things to do. What do you think? Why is people surprised about this small details? Do you consider that in some situations these examples could´t be applied? Please leave your thoughts, would love to read your comments below.